Project Echo was designed to be a significant step in the United States’ space program. Project Echo was intended to be used for peaceful purposes. It would in due course benefit all mankind (Swenson, Grimwood, & Alexander, 1989). Therefore, in 1947 it may have been prudent for the US Air Force to claim that a weather balloon, Project Mogul balloon, or an alien flying disk had crashed at Roswell than to tell the truth and expose Project Echo. Roswell wreckage was that of a weather balloon. Later, the United States Armed Forces claimed that the debris from the Roswell crash was bits and pieces of a Project Mogul experimental high-altitude surveillance balloon. Regardless, according to a US Air Force report, the Roswell wreckage was quickly taken away by the Air Force. The Roswell crash represented the beginning of a new cover-up process that was part of an airborne system for atomic-age spying. The process was developed by Columbia University, New York University, and the Woods Hole Oceanographic Institution (Broad, 1994). A recent Amazon.com search for books written about the Roswell UFO yielded 622 results. It would be rare, if all 622 books contained the exact same information and arrived at a common conclusion about what occurred at Roswell in 1947. Contradictory information about the Roswell UFO incident is abundant. Conflicting information inhibits creative thought and decreases the ability to innovatively solve problems. As a consequence, conflicting or differing information causes confusion and makes it difficult for even the most brilliant sages to effectively explain the UAP/UFO phenomenon. Some of those who study and contemplate UFOs—ufologists—are pseudoscientists. Traits of pseudoscientists include, but are not limited to: Not adhering to good science, stressing ambiguous scientific claims that lack evidence, using jargon, intimidation, and demanding whatever hasn’t been verified as false must be accepted as true. In this fashion, pseudoscientists avoid disseminating factual material to their audiences. Fake stories are sometimes spread by pseudoscientists. Such stories embody a marketable mixture of fact, science fiction, fantasy, rumor, and disinformation. In the twenty-first century, the public seems to be seeking out factual answers about UFOs. Spreading weird assertions linked to the UFO marvel helps conceal the true nature of the phenomenon, thus affording government officials the necessary cover and additional time to figure out what is really going on. My recent research shows that in addition to the government, ufologists, skeptics, and others may be adding to a massive cover up. In short, where there is no evidence, there is no science. True scientists cannot afford to automatically disregard observations, information, and experiments that refute a certain theory (Stanford Encyclopedia of Philosophy, 2008). We are currently living in a post-truth era. Alternative facts and fake news compete with peer-reviewed research (Birkinshaw, 2017). A post-truth or post-factual civilization makes decisions that are not based on what is true and proven. Such a society follows the beliefs of their members—not factual information. Today more than ever, truth must be factual, or at least have a correspondence with reality (Brown, 2016). In a post-truth world, assaults on science must be repelled. Scientific ufologists are a necessity. UFO literature should not be aimed at the general public alone. Instead, modern ufologists’ writings must stand for accuracy, align with established standards, and withstand a stringent peer review process. Results of research must be verified. Failures can’t be ignored, excused, hidden, lied about, discounted, explained away, rationalized, forgotten, or avoided. When a preponderance of new evidence contradicts old ideas, the proof must be accepted and assimilated. The job of scientific ufologists is to convince—not convert (Coker, n.d.). Soon after the 1947 Fourth of July holiday, a rancher reported to the local sheriff that he might have recovered the remains of a flying saucer. Unfortunately, no one saw the saucer while it was airborne (Rudiak, 2001a). Although UFO researchers interviewed numerous witnesses, only a few of the witnesses claimed to have seen the suspected saucer debris. Of these few people, only a handful said to have actually held the material. At least one of those handlers was positive that the remnants were not from an extraterrestrial spacecraft (Korff, 1997). Major Jesse Marcel from the Roswell Army Air Field was assigned to look into whatever crashed on a ranch near Roswell that summer in 1947. Marcel drove to the ranch to examine and collect the wreckage. It was General Roger Ramey who ordered Marcel to bring the found wreckage to Carswell Air Force Base in Fort Worth, Texas. There, General Ramey held a press conference with Marcel present. It was Ramey who first announced that the wreckage was from a weather balloon. He lied. Colonel Thomas J. DuBose was present when the alleged Roswell wreckage arrived at Fort Worth in 1947. DuBose was brought into General Ramey’s office where he viewed the rubble. Decades later, during an interview, DuBose was asked if the original debris in General Ramey’s office had been switched with the remnants of a weather balloon. DuBose answered that the material was never switched. Still, DuBose was unyielding that there was indeed a cover up. DuBose did not know the real source or identity of the Roswell fragments. However, contrary to what was claimed at that time, DuBose did know that it was not an ordinary weather balloon. So, what was the object that crashed near Roswell? In his book, The Roswell UFO Crash: What They Don't Want You to Know (1997), Kal K. Korff presented previously unpublished, formerly classified photos and drawings of various components of Project Mogul. Korff claimed that from his photos and drawings, it is clear that Project Mogul was made of the same material as the rubble DuBose saw in Ramey’s office. Thus, Korff concludes that wreckage found at Roswell was indeed from a Project Mogul constant-altitude-level balloon train equipped with intelligence gathering instruments. Korff goes on to conclude that the whole Roswell UFO hysteria was caused by people who did not know the true identity of the retrieved material they were looking at (Korff, 1997). The crux of the whole Roswell UFO mystery has to do with a few firsthand witnesses not being able to accurately identify the exceptional metallic shards and other scrap strewn over a debris field on a patch of sandy New Mexican property. I agree with Korff that there was a cover up at Roswell. Furthermore, I maintain that the cover up did involve an extraterrestrial flying disk. But it did not involve the remnants of an alien flying saucer. Lee Speigel is a writer and reporter who is the only person in history to produce a major presentation at the United Nations on the subject of UFOs. Speigel conducted an interview with Major Jesse Marcel more than 30 years after the 1947 Roswell incident happened. During the interview, Marcel stated that when he got to General Ramey’s office in Fort Worth, the general told him to put some of the Roswell debris on the floor and let the media take a picture of it. Supposedly, the debris was made up of all sorts of materials. A lot of the fragments were made from materials Marcel had never seen before. So, Marcel put pieces of stuff out on the floor, but he did not put out anything odd or anything with detail on it. The media took pictures and one picture appeared in the newspapers. General Ramey allegedly told the news reporters that the debris was nothing but a crashed weather balloon. Later, Ramey wanted to cover up his weather balloon statement because he didn’t know, himself, what the debris was. Essentially what they did at Fort Worth that day was to make a mock display with a battered weather balloon and let the press take pictures of it. The whole thing was a cover-up (Speigel, 2017). In addition, Charles B. Moore was one of three surviving Project Mogul scientists identified in a 1994 Air Force report related to the Roswell event. Moore maintains that many of the materials used in New York University Project Mogul Balloon Flight 4 bear striking similarities to pieces of the 1947 Roswell crash debris. After Flight 4 was launched from Alamogordo, it was tracked as far as Arabela, New Mexico, approximately seventeen miles from the location of the debris field. No diagram is available for Flight 4 because no data were obtained for it in formal New York University reports (Thomas, 1995). The prominent meteorologist, Dr. Spilhaus, who was hired to develop high altitude balloons for Project Mogul, was associated with New York University (Broad, 1994). Science is a body of knowledge acquired through curiosity by using a structured approach. More importantly, science is a process of becoming less wrong over time. Perhaps the most efficient and effective way to solve the UAP/UFO phenomenon may be to encourage genuine scientists to help fortify the masses of those who currently study aerial anomalies. Today, effectively investigating UFOs requires that more genuine scientists—people who rigorously follow scientific methodology when investigating curious phenomena—join the current ranks of ufologists. These scientists must be able to utilize higher order thinking skills. Higher order thinking skills describe intellectual abilities and skills considered to be advanced cognitive processes. Higher order thinking skills encompass the abilities to analyze, evaluate, and create solutions by putting facts together in new ways (Anderson & Krathwohl, 2016). The extraterrestrial hypothesis (ETH) proposes that some UFOs are best explained as being physical spacecraft occupied by extraterrestrial lifeforms from other planets (“Extraterrestrial Hypothesis,” n.d.). The 1947 Cold War hostility between the United States and the Soviet Union produced the initial surge of UFO sightings. The first report of a flying saucer over the United States came in June 1947. Kenneth Arnold, a private pilot, sighted several disk-shaped objects near Mt. Rainier, Washington. Arnold's encounter was followed by a torrent of additional sightings from all over the United States. In 1948, Project SIGN was established to collect, collate, evaluate, and distribute—within the US government—all information relating to such sightings. UFOs might have been a real national security issue (Haines, n.d.). 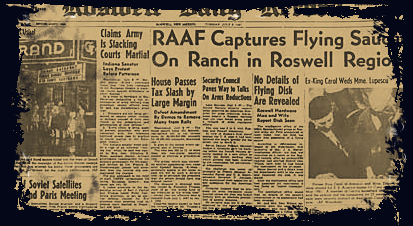 On July 8, 1947 Roswell Army Air Field issued a press release stating that a flying disk had crashed on a ranch near Roswell, New Mexico during a powerful storm. Later, a press conference was held and it was restated that a weather balloon had crashed. Reporters were shown debris allegedly taken from the crash area. The debris included: foil, rubber, and wood, which seemed to confirm the object had indeed been a weather balloon. After initially reporting that the debris had come from a UFO, the Roswell Daily Record submitted a correction which included a statement that the debris was actually pieces of a weather balloon (Edwards, 2015). During a span of more than thirty years, the Roswell crash story all but faded away. Then, in 1978, The National Enquirer reported the original Roswell Daily Record story again. However, the follow-up correction was not reported in The National Enquirer. When the new uncorrected version of the story was published, theories about an alien spacecraft cover up spread. Around the same time, Stanton Friedman, a UFO researcher, started interviewing several people supposedly connected with the incident. Two years later in 1980, the Roswell Incident book was published. Upon the book's publication, The National Enquirer interviewed Marcel again. As a result, all sorts of hypotheses were proposed. Soon assertions surfaced that the US government was indeed covering up information about an alien spacecraft (Dunning, 2007). According to some, the government refuses to divulge the results of its UFO investigations (Haines, n.d.). A failure of imagination is a circumstance wherein something seemingly predictable and undesirable was not planned for. My research seems to indicate that unknown unknowns existed throughout the course of the Roswell UFO incident. Specific to the 1947 Roswell crash, UFO researchers, skeptics, and the public did not seem to know that a passive communications satellite experiment using metalized balloons—functioning as extraterrestrial relays—had the exclusive attention of the US government. 1964: NASA’s Echo II satellite was sent into orbit around the Earth. The 135-foot rigidized balloon satellite was injected into orbit as a passive communications experiment (Figure #5). 1961: NASA’s Echo IA satellite was successfully sent into orbit around the Earth. Figure #6. A scale prototype of an Echo Satellite, 12 feet in diameter (Courtesy of NASA). 1960: A Skin Stress Test of a 12-foot satellite built as a prototype of the full-scale Echo Satellite was carried out on May 1, 1960 (Figure #6). 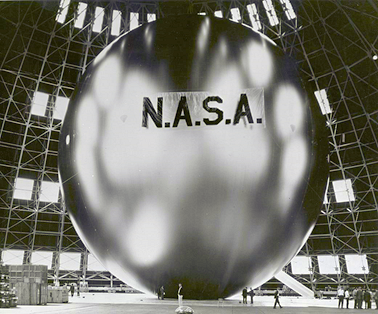 1959: The initial test launch of a 110-foot-diameter inflatable sphere for the Echo 1 Passive Communications Satellite Project ended abruptly with the sphere exploding as it inflated. Thousands of fragments of the aluminum-covered balloon floated back into the atmosphere reflecting the light of the setting sun. It resulted in the sensation of flashing lights. Along the East Coast, reports of extraordinary sightings came pouring into the police, newspapers, television stations, and radio stations. Many people inquired if those mysterious specks of light were fireworks, a meteor shower, or UFOs (Hansen, 1995). 1958: A 100 foot Echo Satellite underwent inflation tests (Figure #7). Figure #8. Engineer W.J. O'Sullivan, Jr. with a 20 Inch Sub satellite (Courtesy of NASA). 1957: By the middle to late 1950s, all the technologies necessary for satellite communications had been invented. All that remained was to demonstrate the technologies and to compare the different innovations discussed in the technical literature (Whalen, n.d.). During that time span, small passive communications satellite prototypes were under development (Figure #8). 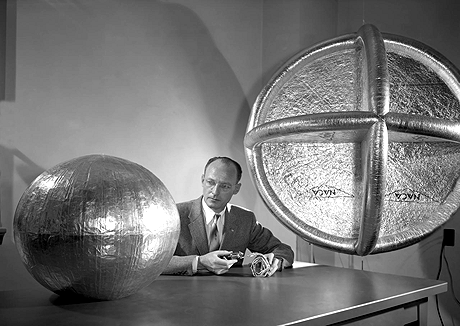 Prototypes included various sizes and varieties of flying spheres and flying disks that had been experimented with for several years (National Aeronautics and Space Administration, 1957). 1956: As with many early NASA programs, Project Echo originated as a National Advisory Committee for Aeronautics (NACA) effort. NACA was formed in 1915. The original purpose of Project Echo was to measure the density of the air in the upper atmosphere, as well as to provide data related to the design of future aircraft, missiles, and spacecraft. As with many other experiments, the concept that led to Project Echo had modest beginnings. With persistence, it ended with memorable results. After years of developments, Project Echo was eventually placed on an official list of approved experiments to be launched into space. 1952: BoPET balloons were not officially built before 1952 (Baluncore, 2016). BoPET, which evolved from polyethylene terephthalate (PET), was a prototype of Mylar. Passive communications satellites were made by constructing a balloon, or satelloon, of thick Mylar film bonded between layers of heavy aluminum foil. Mylar is an aluminum coated plastic material that was, in the long run, used for US passive communications satellites. During the 1950s, prior to the presence of Mylar film, Project Echo experimental balloons were made from BoPET film. BoPET is a polyester film made from stretched polyethylene terephthalate (PET). PET was developed in the early 1940s, several years before the Roswell crash (“BoPET,” n.d.). Early experimental PET, BoPET, and Mylar balloons had a revolutionary surface. Unlike the spherical surface of a latex balloon, these balloons resembled a slightly flattened sphere. This innovative shape is realized by inflating a balloon made of two circular sheets of flexible, inelastic material—now known as Mylar (“Mylar Balloon,” n.d.). Therefore, early Mylar-like balloons would have resembled flying disks. They appeared to be more disk-like than sphere-shaped. In the air, the novel large experimental passive communications satelloons may have been perceived as extraterrestrial flying disks. 1947: A flying disk (flying saucer) crashed near Roswell, New Mexico. That same year, Project Mogul was being employed as a super-secret operation that involved the use of balloon trains that were equipped with various devices for intelligence gathering purposes. Project Mogul was a classified operation begun by the US government after the end of World War II to spy on the former Soviet Union in order to determine the status of Russian attempts to build nuclear weapons. On July 8, 1947, the public information office at RAAF made the shocking announcement that they had recovered the remains of a flying disk. Only a few eyewitnesses claimed to have actually handled material from the disk. At least one of those material handlers was resolute that the stuff was not from an extraterrestrial spacecraft (Korff, 1997). It is highly probable that the flying disk, unbeknownst to the examiners and collectors of the Roswell wreckage, was a precursor of an extraterrestrial relay device made of polyethylene terephthalate (PET) metalized with aluminum. Bits and pieces of materials from the Roswell crash were flown to General Ramey in Fort Worth, Texas. Descriptions of the wreckage shipped to Ramey’s office seemed to describe a combination of the inflatable metalized balloon from a Project Echo prototype as well as parts from a Project Mogul balloon train. 1946: An independent study of Earth satellites by Project RAND on behalf of the Army Air Forces observed that a satellite launch would have a dramatic effect on world opinion and that a satellite might have promising uses as a communications relay. In spite of a curtailment of military research and development funds under President Truman’s administration, subsequent RAND studies of geosynchronous communications satellites and the political and psychological aspects of launching spacecraft continued (Whalen, n.d.). Also in 1946, a panel was developed to study experiments worthy of being launched by V-2 rockets. Prototype development was encouraged. In order for a passive communications satellite system to get funded, it was imperative that the project be endorsed by this esteemed panel. The Upper Atmosphere Rocket Research Panel was formed in 1946 to help select the most launch-ready, viable experiments to be carried aboard captured and renovated German V-2 rockets. The panel was originally known as the V-2 Panel. During that year, Project Echo seemed to be a potential candidate for launching aboard a V-2 rocket. Project Echo was based upon Arthur C. Clarke’s concept of an Earth orbiting satellite system. 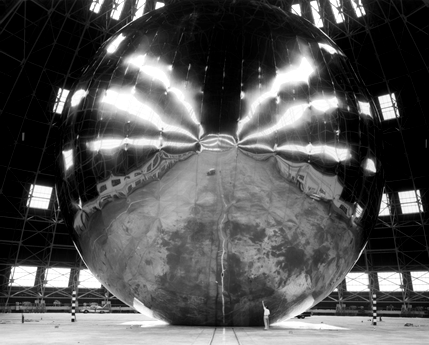 Project Echo’s satellites were intended to be inflatable spheres with a thin metal-coated plastic skin. In the long run, Project Echo satellites ended up being large aluminum-coated Mylar balloons (Hansen, 1995). 1945: The initial concept of a passive communications satellite system was proposed by science fiction writer Arthur C. Clarke. Clarke was the godfather of communications satellites and a Royal Air Force officer who hoped to revitalize the British Interplanetary Society after WWII. In an October 1945 Wireless World magazine article, Clarke wrote about the development of a geosynchronous satellite. Clarke’s article was entitled: “EXTRA-TERRESTRIAL RELAYS.” He predicted the development of a telecommunications system based on artificial satellites orbiting Earth. For all intents and purposes, these satellites were extraterrestrial flying disks. Three fixed satellites would provide complete global communications coverage (Whalen, n.d.). Passive communications satellite makers needed Dr. Robert H. Goddard’s rockets to place their satelloons into orbit. Rocket scientist, Dr. Robert Goddard, died in August 1945. However, following his death, Dr. Goddard’s widow, Esther Goddard, completed many of his projects (National Aeronautics and Space Administration, n.d.). By July 1945, Operation Overcast and Operation Paperclip, two highly secret programs, were established to exploit V-2 rocket knowledge. 1945-1942: Dr. Robert H. Goddard was Director of Research for the Navy Department Bureau of Aeronautics. He was developing and testing jet-assisted takeoff and variable thrust liquid propellant rockets, in Roswell, New Mexico and Annapolis, Maryland (Goddard Memorial Association, n.d.). 1942: American science fiction author, George O. Smith, proposed Earth-Venus relay communications satellites (Whalen, n.d.). Also, in 1942, Dr. Robert Goddard was placed on contract at Annapolis, Maryland to develop rocket takeoff mechanisms (Roswell Museum and Art Center, n.d.). 1941: John Whinﬁeld and James Dickson developed polyethylene terephthalate (PET). PET was patented in 1941 (Johnson, 2017). 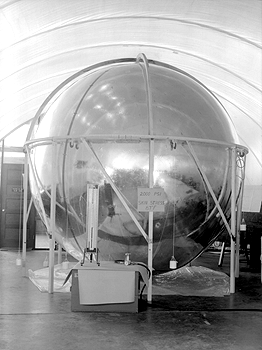 The 1947 Roswell balloon crash most probably involved a metalized PET balloon. It would have been a precursory passive communications satellite balloon experiment made from PET. In 1941, BoPET inflatables were not yet totally developed. 1940-1930: During the 1930s and 1940s, Roswell, New Mexico was the home of Dr. Robert H. Goddard. On a ranch near Roswell, Goddard and his team established a rocket research site and conducted rocket experiments (The New Mexico Museum of Space History, n.d.). Scientists at this rocket science test facility collaborated with German scientists about the V2 rocket program. During the post-WWII years, scientists from the Goddard team launched variations of the V2 rocket. 1939: For the most part, Dr. Robert Goddard’s rocket work predated the technology used for the German V-2 missiles. Toward the beginning of WWII, German engineers and scientists occasionally contacted Dr. Goddard directly in New Mexico with technical questions. Thus, before 1939, many of Goddard’s developments may have been copied by German engineers as they developed their V-2 rockets (“V-2 rocket,” n.d.). 1923: Hermann Oberth speculated about the use of geosynchronous communications satellites (Whalen, n.d.). After conducting select interviews, analyzing existing literature, and evaluating data, I arrived at the following conclusion: During the early and middle 1940s, experiments essential to launching passive communications satellites were being conducted in New Mexico. In Roswell, from approximately 1942 to 1945, Dr. Robert H. Goddard and members of his rocketry team were developing and testing German V-2-like rockets. A passive communications satellite system was proposed by science fiction writer Arthur C. Clarke in 1945. In 1946, Dr. Athelstan F. Spilhaus, was developing high-altitude balloons that would stay at a constant height. Dr. Spilhaus’s experiments pioneered the use of polyethylene balloons which were an important tool related to high-altitude research. Polyethylene balloons were manufactured in Mamaroneck, New York and Minneapolis, Minnesota. Experimental balloon test flights were launched from Alamogordo, New Mexico. The type of rockets Dr. Goddard and his team were working on would be needed to inject Clarke’s passive satellite communications system into orbit around Earth. Members of Dr. Goddard’s rocketry team were living and working near Roswell in 1947. Therefore, it is highly probable that in 1947, an experimental metalized inflated polyethylene terephthalate (PET) balloon, intended for future use as a US government Project Echo passive communications satellite, was covertly undergoing testing as part of, or in conjunction with, a Project Mogul balloon train. The Project Echo precursor had instruments added to it that included some type of temperature sensors to monitor the prototype balloon's skin temperature and pressure sensors to monitor internal pressure. The metal-coated PET balloon was struck by lightning in the vicinity of Roswell, New Mexico during a severe thunder storm. The prototype inflatable metalized balloon—designed to function as an extraterrestrial relay—exploded into shreds when hit by lightning. Hundreds of shards from the metal-covered balloon floated down upon a ranch near Roswell. Following is a succinct summary of the Roswell UFO mystery: Intelligence is the ability to solve problems and create products that are valued in a culture. Since about 1945, the US government valued passive communications satellites made of a flexible, inelastic material that was coated with metal. Polyethylene terephthalate (PET) had been invented in 1941. In 1946, experiments were being conducted with polyethylene to develop high-altitude balloons. Some of the debris retrieved from a ranch near Roswell, New Mexico had an aluminum-like dull finish on one side, but appeared shiny on the other. The fragments were thin, lightweight, and would flex when struck. That debris field near Roswell was hard proof that scientists had invented a way to coat polyethylene with metal by 1947. Thus, technically, an extraterrestrial flying disk did crash close to Roswell, New Mexico during the summer of 1947. The simplest explanation is the best one. Federal Bureau of Investigation. (n.d.). Project Blue Book (UFO). In FBI Records: The Vault. Friedrich, T.L. & Mumford, M.D. (2009). The Effects of Conflicting Information on Creative Thought: A Source of Performance Improvements or Decrements? Creativity Research Journal, 21:2-3, 265-281. Gangi, S. (2011). Differentiating Instruction using Multiple Intelligences in the Elementary School Classroom: A Literature Review. Unpublished master’s thesis, University of Wisconsin-Stout, Menomonie, Wisconsin. Gardner, H. (1999). Intelligence Reframed: Multiple Intelligences for the 21st Century. New York, New York: Basic Books. Olmsted, K.S. (2009). Real Enemies: Conspiracy Theories and American Democracy, World War I to 9/11. Oxford University Press. Rudiak, D. (2001b). 2. Tough, Flexible, Foil-like Material, with Memory. In Roswell Proof. Retrieved April 21, 2018, from (http://roswellproof.homestead.com/debris2_memory_foil.html). It was a well written piece. I don't have evidence to make a sound judgement towards any theory of the Roswell incident but do have to question Dr. Gross's claim that the first "flying saucer" report in the US wasn't made until June 1947. That seems rather late, I'm not sure it will stand up to the most basic review of old newspaper headings. I've yet to find out. He seems to cite a lot of sources even if his sources conflict on conclusion, so perhaps he's right and has researched the first saucer rwport.